Hi all. 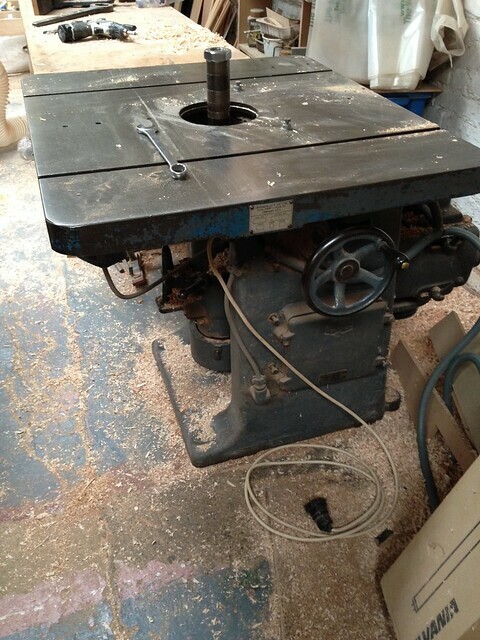 Just received a 2nd hand Felder F700 spindle moulder. It doesn't have a power feeder but I'm keen on getting one. It's a 3 phase and I will probably opt for 3 phase power feeder too. What are the options of powering it through the spindle as I don't have any more 3 phase feeds from the consumer unit. When I spoke to felder about a new spindle they quoted for a 3 phase switch to drive the power feeder. Do the power feeders all have separate switches on them as I would.t want it on every time the spindle is running. No experience of 3ph power feeds, but all the single phase ones I've seen have a switch on the body of the feeder to turn on and off and change speed and feed direction. I can't imagine that a 3ph one would be any different. Just bought a 3 phase wadkin with 3 phase power feed . Where the cable goes in there is a basic junction box and that powers the machine and power feed . The grey trunking to the right is the power feed cable that went to that box . Couple of year's ago I upgraded my Felder power feeder with a co matic dc40, a big 4 wheel feeder....240 volts and under 500w....just plug it in a 13 amp socket. It seems felder have my machine logged as having a power point for the feeder but I'm bu**ered if I can find it. I will probably opt for a 240 volt feeder unless I can find a 3 phase splitter. The co matic Dc40 looks nice but I think way too big for what I need. I like the idea of being able to slow it down though. They also do a smart stand for power feeders.....which allows you to raise and lower from the front of the machine....no more leaning over the spindle or walking around it seems a great idea.